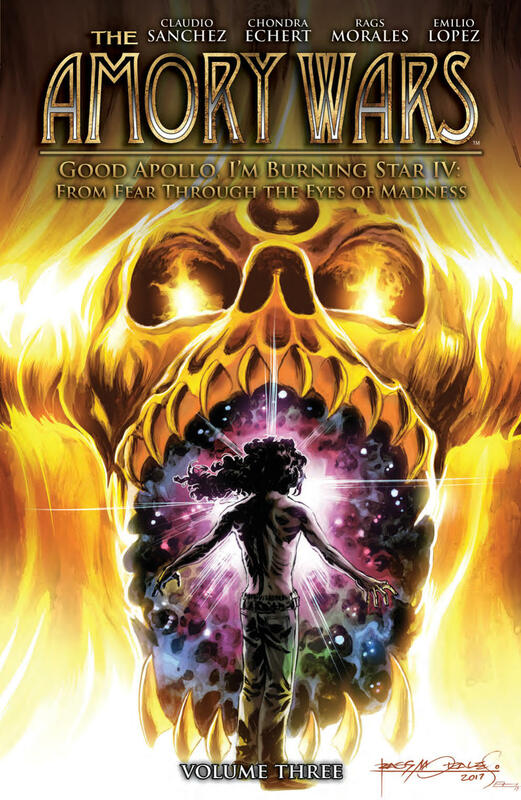 'The Amory Wars – Good Apollo, I'm Burning Star IV: From Fear Through the Eyes of Madness, Vol. 3' TPB Review – AiPT! If you’re not out of breath from reading the title of this review, then I think you’re gonna be just fine. I must be upfront, though: as a massive fan of writer/mastermind Claudio Sanchez’s band, Coheed & Cambria, I may be a little bit biased toward this particular volume. This is a major part of the Amory Wars mythology that I’ve been waiting to see in comic book form for quite some time, so this will double as a review of the latest volume of the series and a look back at this series as a whole. Based on the sprawling mythology of Coheed & Cambria’s concept albums, The Amory Wars tells the story of Claudio Kilgannon, a classic Chosen One type, who awakens to the awesome power within him and sets off to save his galaxy from the oppressive evils that seek to tear it apart. In this most recent maxi-series, we find Claudio running afoul of the Writing Writer, the psychotic creator of the fictional world within which Claudio resides. The Writer has lost control of the plot, literally, and seeks to force his characters into a deadly endgame. This is the second attempt at adapting the storyline of Coheed & Cambria’s third album, Good Apollo, I’m Burning Star IV, Volume One: From Fear Through the Eyes of Madness (WHEW! ), into the medium of comics, following 2005’s graphic novel of the same name. That original book, breathtakingly illustrated by Pathfinder artist Christopher Shy, attempted to jump into the middle of an already expansive story, and suffered from financial constraints that caused much of the story of the album to be trimmed out of the final product. While still an interesting and visually arresting read, it is clear that quite a bit was lost in translation. Now, thanks to BOOM! Studios, superstar artist Rags Morales, and writer Chondra Echert, that story has been completely told in the way that Claudio Sanchez originally intended. It’s a bombastic affair, full of cyborg assassins, messiah-like warriors, fallen angels, and soul-stealing dragonflies. It’s a lot to take in, requiring readers to be intimately familiar with the lore of Heaven’s Fence. If you’ve stepped away from The Amory Wars for any length of time, a refresher will be required before getting into this final chunk of From Fear Through the Eyes of Madness. Even though the majority of this final volume is made up of a gigantic battle scene, it can be easy to lose characters’ names or forget their relationships with one another in the shuffle. As in previous volumes of The Amory Wars, the tendency to include lyrics in the spoken dialogue of the characters can occasionally read as unwieldy or clunky, but it’s also a nice nod to the fans who have spent years poring over liner notes and lyric booklets, hungry for the meaning behind it all. In this sense, your mileage may vary. This volume in particular has some major surprises for even the most die-hard of fans, particularly in regards to the fates of some characters, like Inferno and the Writer himself. This volume also has the strongest emotional payoff of the series so far, featuring several revelations and a major death that will inform our protagonist’s actions going forward. Fans of the albums’ lore will be anticipating the biggest death, but the scene in which it occurs still carries a surprising amount of weight on the page. Previous Amory adaptations have fleshed out the story in major ways, but this latest installment takes the story down new avenues that the original album only hinted at, leaving the door wide open for the next chapter to bring everything full circle. Taken on its own, this volume is a quick, brutal read and it capably sets the stage for an even wilder finale. As a whole, however, some of the series doesn’t quite pan out in a satisfactory way. The ways in which the Writer’s powers work is still kind of hazy and more than one supporting character seems to have been dispatched or otherwise incapacitated off-panel, which can be frustrating when one considers it may be a while before we get the next series. Overall, though, I was very pleased with the end result of this series, far more satisfied than I was with the first two volumes or even the original standalone Good Apollo graphic novel. There has been a massive leap forward in quality for both the storytelling and visuals, which leaves me very hopeful for the upcoming No World For Tomorrow adaptation, whenever that may happen. Mileage may vary for non-Coheed & Cambria fans. For my money, this volume splendidly caps off the most successful 'Amory' adaptation to date.